What people say about Caroline's Little Kitchen. "Hugo and Caroline are Great. Caroline has been great from initial contact to the event. We couldnt have asked for more for our event. Great people and great crepes!! Thank you so much." "Amazing Fantastic little business, not only did it look great at our event but was also a huge success. Friendly staff and I hope to see them again next year." "We used Caroline's Little Kitchen at our music festival party in Winchester. Caroline and her husband delivered on incredible friendly and efficient service of crepes, cakes and hot drinks in their beautiful vintage van. Feedback was really positive from all our guests and particuarly good value for money. Highly recommend." 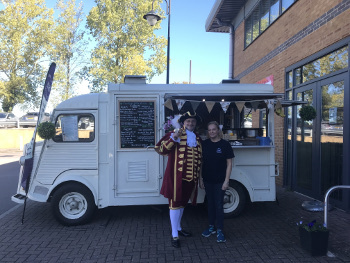 "Delicious Crepes Caroline served the most delicious crepes for our evening wedding reception, the van looked superb and everyone was thrilled and excited to see 'Hugo'. Caroline and her team were very effiicient and very tidy. We loved the little touches like the bunting! Thank you." Hear my interview with BBC Radio Wiltshire. We cater for all tastes and can produce sweet and savoury crêpes. This includes sweet options like Nutella and Banana or Fresh Strawberries with White or Milk Chocolate Drops and Chocolate Sauce. Our savoury options include Cheddar Cheese, Tomato and Rocket or Cheddar Cheese and Pesto. Copyright © 2018 Caroline's Little Kitchen. All rights reserved.